One Loaf of the Most Basic Utility White Bread! 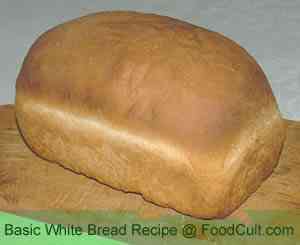 As with most of our recipes, pretty much no special tools are required to make this basic white bread. While this basic white bread recipe may not sound exciting it is, in fact, the foundation for so many other breads. In itself it is not sweet or salty or rich with milk. What this basic loaf of bread is, is French Toast waiting for a place to happen. This basic loaf is bread crumbs - un-crumbed. It is the foundation of so many wonderful variations that, if you never learn another recipe, this is the one bread recipe you will really need. If you are of the Jewish faith, it is Pareve (can be used with milk or meat). This bread is the pallette upon which you put what ever decoration strikes your fancy. Mostly oil free, this loaf of about a pound (around 500g) has only one teaspoon of salt and sugar. While you may elect to make small adjustments based on taste, this vegan loaf is the perfect foundation bread. Finger Sandwiches for party entertaining.